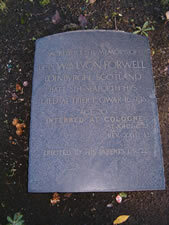 William Forwell was the son of Henry and Margaret Forwell, of 14, Duddingston Park, Portobello, Edinburgh. He enlisted in 1914. As yet, we do not have a photograph of William, however we found his grave in North Merchiston Cemetery and attach a photo of this. He died at the age of 20 and his name was on the WW1 memorial at North Merchiston Church.